Spring Session of Little Tigers Preschool Martial Arts begins on March 5, 2019 at 4:00 pm. Get more information and register your 4 – 6 year old martial artist for this awesome program! What makes the Alexandria Martial Arts & Movement preschool Little Tigers program different than all the other programs? Developmentally appropriate martial arts techniques and skills. Brain Gym-based exercises and games for increased focus, body control, and attention. Brand Skills, Drills, Techniques, and New Equipment for each of the Little Tigers. 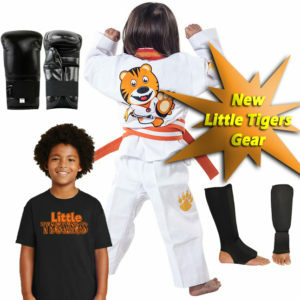 Brand new Little Tigers Gear! Other new Little Tigers gear! © 2019 Alex Martial Arts. Built using WordPress and OnePage Express Theme.